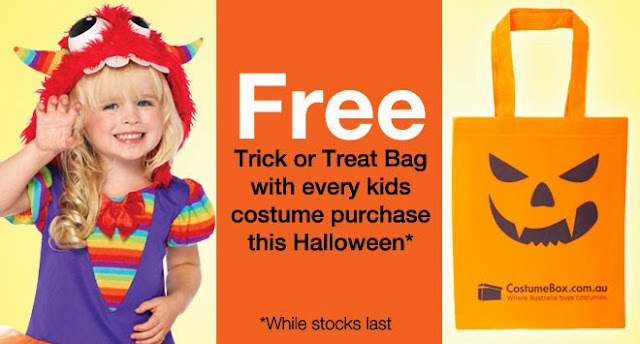 Extra, extra read all about it - CostumeBox.com.au is giving away a FREE Trick or Treat Halloween bag with every kids costume purchase while supplies last! Check out the HUGE range of kids costumes and accessories for infants, toddlers, boys and girls online and get ready for Halloween in style with Australia's best online Halloween shop! 1. Set Clear Rules - Before going out, state the rules for all the children. Assigning roles to the older ones and making sure you stick with the plan yourself makes it easier for everyone to be on the same page. 2. Map out a Route - Talk to your closest neighbors and plan which houses you are going to visit. That way, you can determine the streets you'll be going to and know exactly the doors you'll be knocking. That helps for anyone joining a bit late or staying behind to be able to catch up. 3. Don't go into anyones house - Even if you know the person, trick-or-treating is about walking around the neighborhood, greeting people, and, of course, getting candy, so no need to go in for a visit. Moreover, as you do that, tell your child how important is to never go inside someones house for candy. 4. Reinforce Stranger Danger - This is probably something you've told your kids before; however, it is especially important during Halloween to make sure they don't talk to strangers. Talk to them about strangers driving by and asking for help or directions, and tell them to look for an adult immediately. 5. Have fun - Make sure you get lots of pictures and once you have collected all the candy etc.. get ready for the trading to begin.